News | Dunn Associates, Inc. It is with great excitement that Dunn Associates, Inc. formally announces recent changes in leadership. Tait Ketcham has been promoted and will serve as President of Dunn Associates, Inc.
Perhaps a better stated question would be: What experience do you want? What experience are you willing to pay more for? What are your expectations with respect to this experience? After holding their breaths for what seemed like an eternity, Darren and Greg are exhaling a collective sigh of relief (…along with the rest of us). Darren G. Dickson and Gregory S. Dunn received word from the State of Utah that they had passed the 16-hour licensing exam and obtained their S.E. designation. Dunn Associates, Inc. is growing strategically and looking for the best people. As a leading structural engineering firm in the intermountain area for over 20 years, Dunn Associates continues to be involved with some of the best projects in the region. Exclusively focused on structures, we innovate, create and optimize unique structural solutions for our loyal public and private clients. The successful candidate will first and foremost be required to have high personal skills while interacting with our clients. We are professional consultants and our attitudes and manors are of high importance. Interaction with design and administrative professionals within our office is expected. STRATEGIC MARKETING PLAN – Continue to implement the overall strategic plan regarding Dunn Associates, Inc. and its marketing endeavors. CLIENT RELATIONS – Work closely with principals, associates and others to foster and advance relationships with top clients and potential clients. Leverage a network of relationships with key decision-makers, primarily with owners, architects and contractors, to establish good will, share project leads and expand opportunities with the public sector clients. PROPOSALS / QUALIFICATIONS – Respond to RFPs and RFQs, including requests by architects and contractors who are responding to RFPs and RFQs, develop the appropriate material to leverage Dunn Associates’ qualifications in regard to the specified projects. Follow self-established and business development leads to track projects both prior to and following the submittal of Statements of Qualifications and Proposals. DATABASE MANAGEMENT – Update information kept in company database (Cosential & Deltek Ajera), including contacts, projects, prospective projects and workload. Work closely with project managers and engineers to develop content for use on the website, in firm profiles, social media, and in RFPs and RFQs. Work with project managers and in-house photographer to acquire photos of current and past projects for use in marketing efforts. PUBLIC RELATIONS – Develop opportunities with news and media organizations to promote Dunn Associates, Inc., its personnel, projects and other accomplishments. Create advertisements according to publication specifications, contract for the advertising space and track the results of advertising efforts. Update and upgrade company website as necessary and appropriate. Work closely with project managers to develop content for bi-weekly posts to news/blog page. Create consistent and meaningful content for social media to increase company exposure for client relations and staff recruiting efforts. Attend industry-related events. Prepare and submit industry-specific award opportunities for staff and projects. ADMINISTRATIVE SUPPORT – As necessary, provide phone support and assist administrative staff in carrying out their assignments including professional licensing, staff recruiting and human resources, workload, and company-sponsored events. Education—Bachelor’s degree; qualified experience may substitute for college education. A working knowledge of marketing-related softwares Adobe Creative Suite (InDesign, Photoshop, Illustrator), Microsoft Office are required. Experience with CRM (Cosential) and/or Deltek Ajera a plus. Experience working in the construction or professional services industry. Established rapport with key decision-makers in the construction industry, particularly architects and contractors would be added value. Compensation is very competitive and varies with experience. Dunn pays full medical for the employee and their dependents, covers full dental for the employee, life insurance policies, engages in 401k matching, contributes $2,000 annually to HSA (Health Savings Account), and gives generous PTO (including holiday and vacation days). Other perks to be discussed as the dialog progresses. 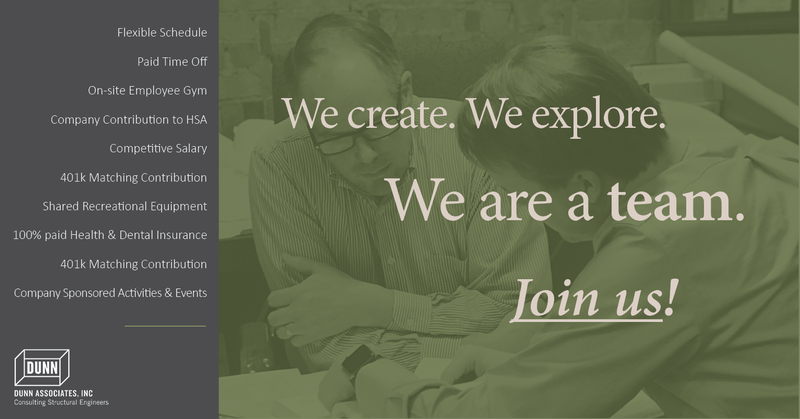 Submit resume and cover letters to careers@dunn-se.com or submit through online form. Dunn Associates, Inc. (DAI) is a full-service structural engineering firm specializing in both public and private clients. We believe in an upbeat work environment while providing our clients with cutting-edge design solutions that consistently exceed expectations. We are currently looking for a highly motivated designer/drafter with great communication skills. At least two years of experience with Revit is preferred, but all commercial structural design candidates will be considered. Dunn Associates, Inc. offers competitive pay and a full benefits package. Submit resume online or email to careers@dunn-se.com. Dunn Associates, Inc. is a leading structural engineering firm in Salt Lake City, Utah. We believe in an upbeat work environment while providing our clients with cutting edge design solutions that consistently exceed expectations. We are looking to add a new member to our team to answer phone calls and provide general office support to the staff. • Effective management of multi-line phone system and presenting a friendly, professional impression for clients and visitors. • Proficient in Microsoft Office software (Word, Excel, PowerPoint) and experience with Adobe Acrobat or Bluebeam. • Ability and willingness to work in a team environment. • Greet and direct visitors; answer multi-line phone in a pleasant, professional manner. • Provide administrative support to upper management and principal engineers. • General office duties will include lobbies & break room area upkeep, meeting scheduling, restock & order supplies. • Organizing and filing drawings and project folders. • Sort incoming mail and create outgoing shipments as needed. • Perform various office duties as assigned.